The mooring last night proved to be very quiet. 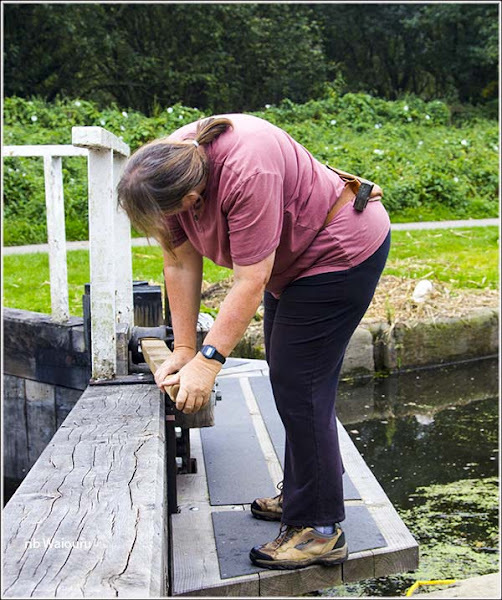 This morning I walked back to Kirklees Top Lock to have a closer look at the top paddle gear. The use of a handspike to operate some of the paddles is apparently unique to the Calder & Hebble Canal. 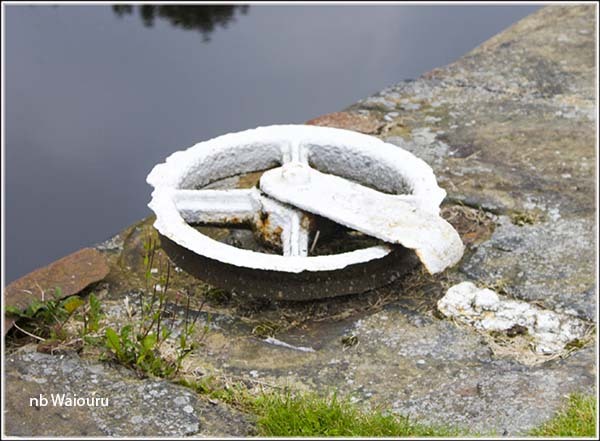 It’s also been interesting to note the shape of some of the lock bollards. 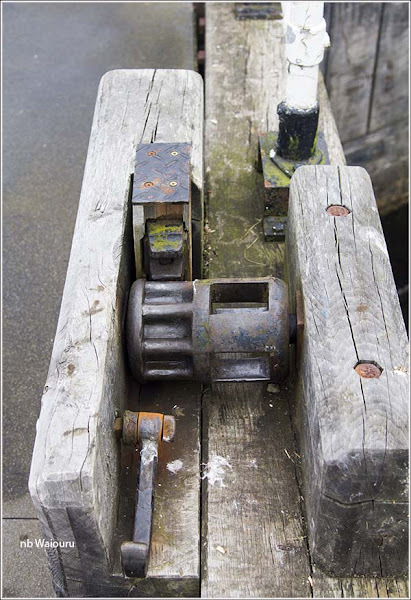 The following pulley was fitted horizontally to the approach wall below the lock. Left over from a bygone era? The actual paddle mechanism looks quite simple. The paddle is connected to a long timber shaft which had a vertical strip of iron cogs attached to the top. If you use the handspike to rotated the gear the paddle is raised. As we start to gain altitude passing through the locks the scenery has started to get more interesting. The ground is beginning to close in on us as we hug the side of the valley. 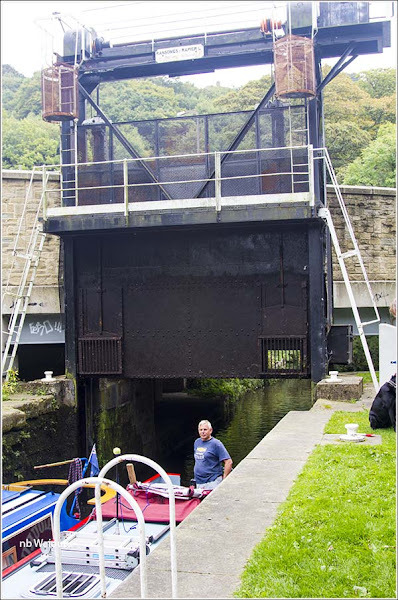 The first lock at Salterhebble has a guillotine lower gate whilst the next two are the shortest we will encounter on our trip across the Pennines. So short that some boats have to pass through them backwards. With our luck we managed to time our arrival with the passage of four Shire Cruisers hire boats coming from the opposite direction. Fortunately the guillotine is electrically operated. There are two 90deg turns in the pound above to enter the second lock. We let Firefly NZ go first and used their length as a measure of whether Waiouru would fit in the lock. It was a bit of a squeeze but she fitted with an inch (or two) to spare. 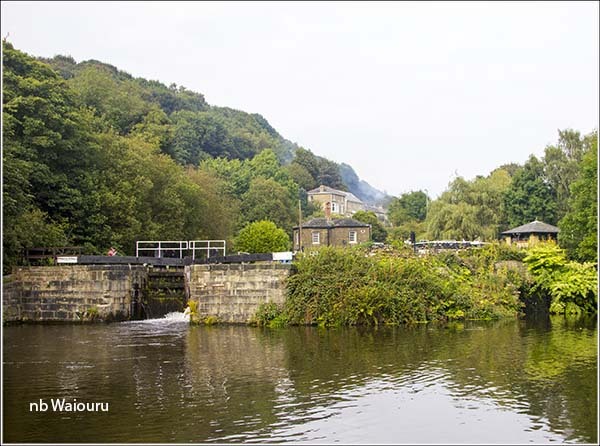 The layout of the locks give the impression you are climbing up the left side of a steep valley. 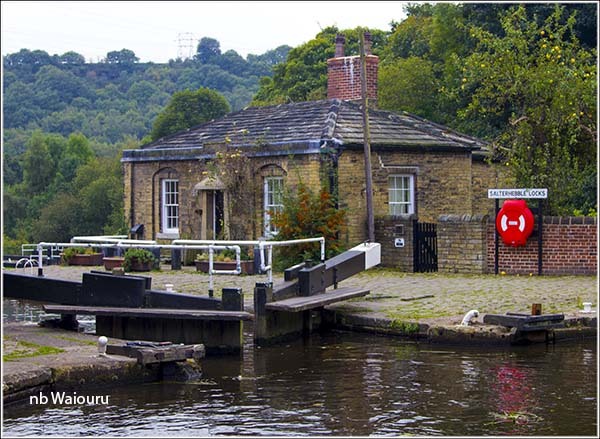 At the top is a rather attractive cottage which in a different time would probably have been the home of the lock keeper. Rather than carrying on up the valley we made a hard left turn and contoured around the face of the valley. 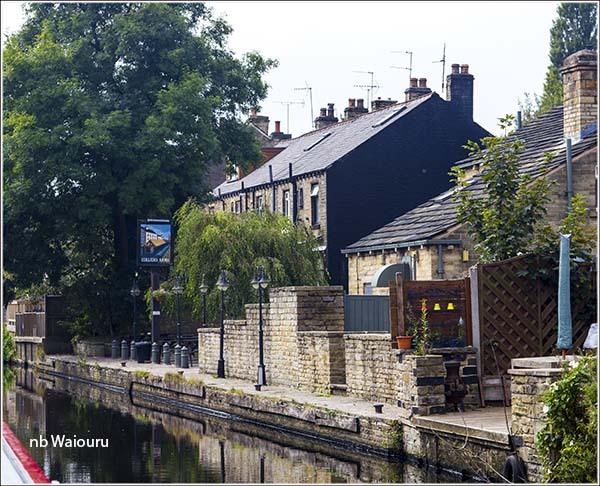 Going further up the valley takes you into Salterhebble on the Halifax Arm. Having gained some height there were good views across the valley to the left. A rather high and long railway viaduct crossed the valley. 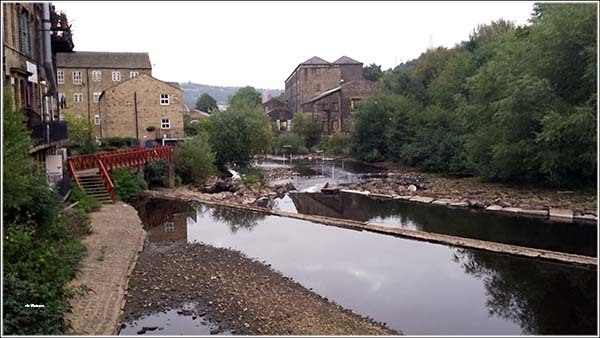 Entering Sowerby Bridge we made a left turn to avoid going down the blind arm. Almost immediately we found a vacant mooring and moored for the day. 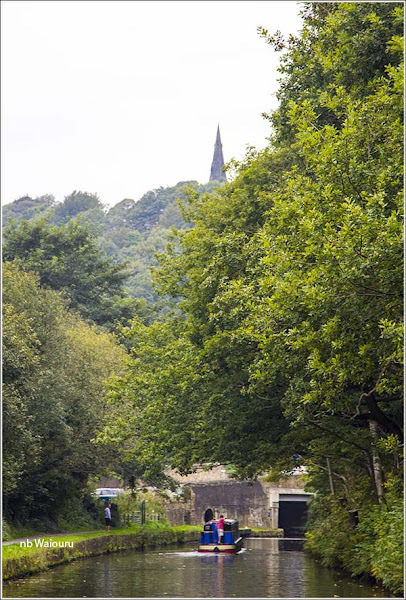 That evening I went for a walk around Sowerby Bridge taking the big camera. It was only when I went to take the first photo that I realized the battery was flat! Fortunately I had a mobile phone with me and was still able to take a few pictures. 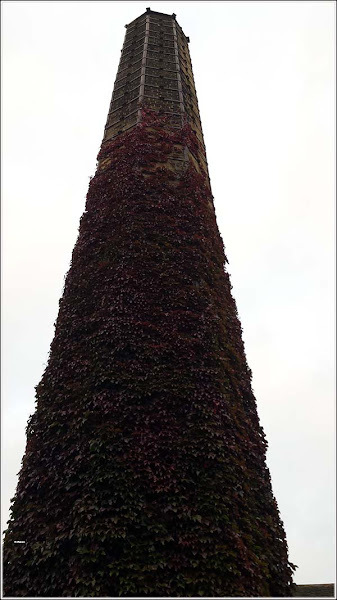 This ivy covered chimney isn’t round. But what most caught my attention was the cast iron bracing. 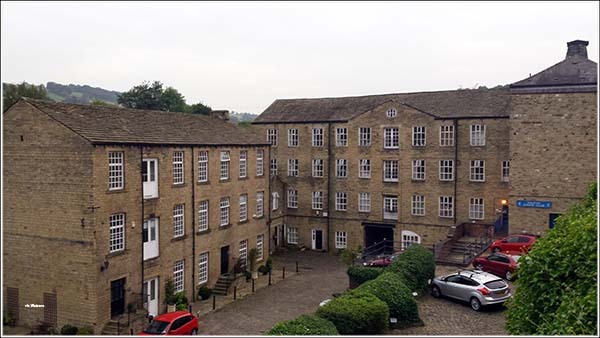 It looks like some of the former mill buildings have been converted to residential apartments. 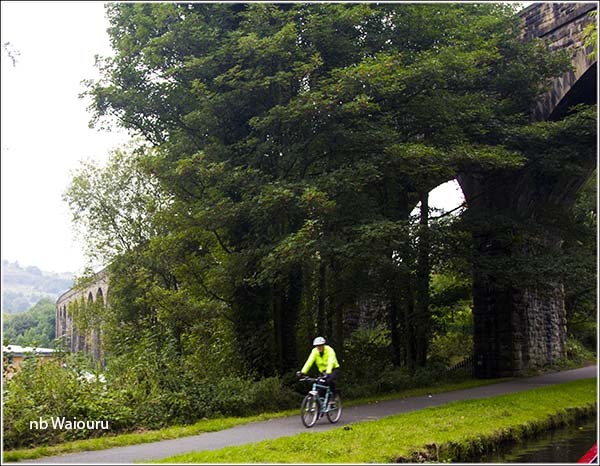 We are still following the same general route as the River Calder which is below the canal. If you look closely at the above photo you can see the white poles suspended above the water marking out a canoe slalom course. 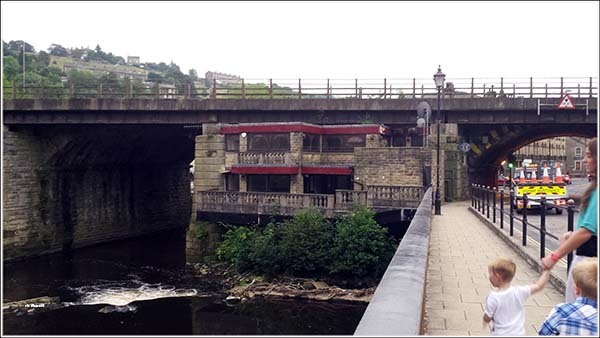 Some entrepreneur had built a nightclub/bar around the railway bridge pier. However it was all boarded up and abandoned so a failed venture! Tomorrow should be a relatively short day as the All Blacks are playing the Springboks in the morning! 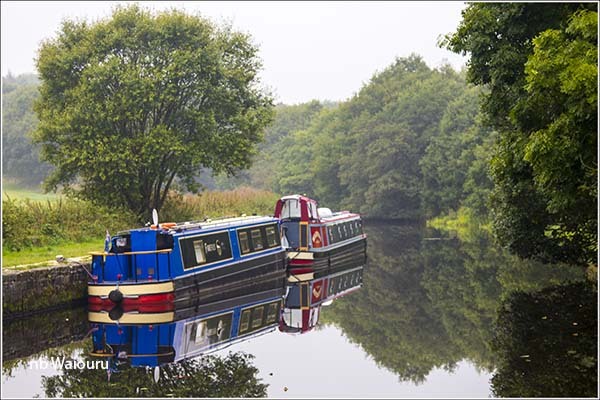 I'm enjoying reading about your travels on waterways which we cruised only a matter of weeks ago. 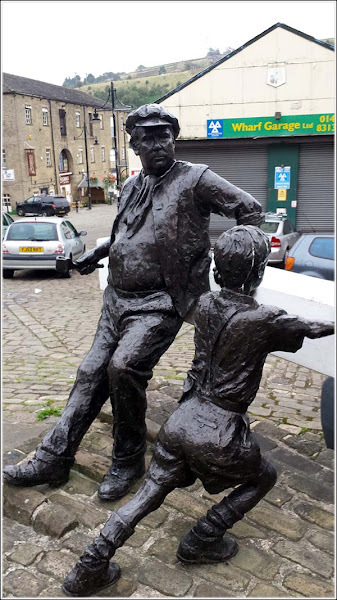 But I fear you have too much Yorkshire "T" in your system - it's more usually known as Sowerby Bridge. 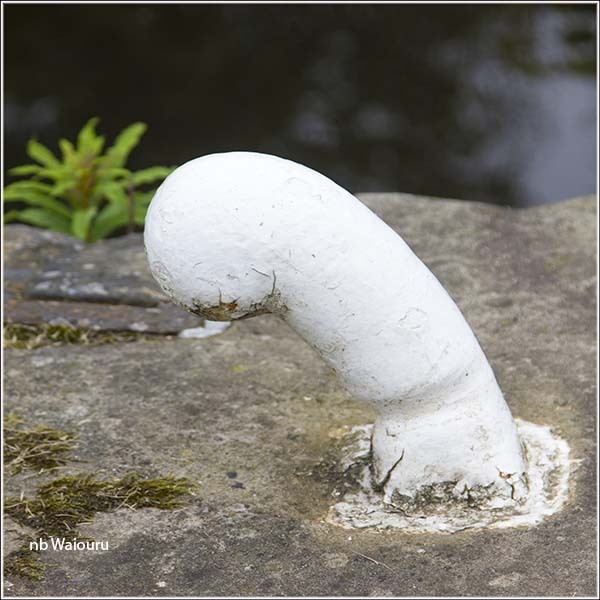 The “lock bollards” you describe are that shape for a purpose. In normal use the long rope from the horse is attached to the boat with a pulley on the boat and a large knot and loop at the end of the rope which stops it pulling through the pulley. The pulley has no effect at that stage. 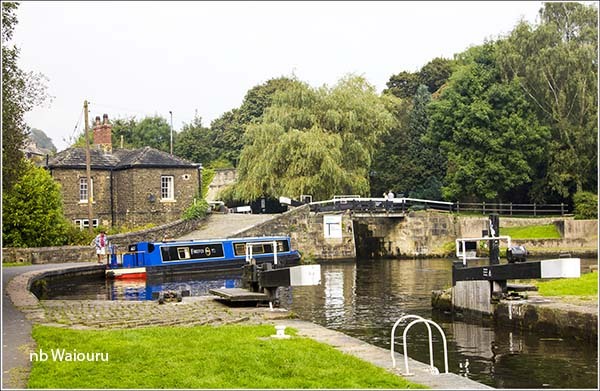 When you are starting from a lock you pull 10m or so of rope back through the pulley on the boat and take it forwards to put the end loop over the “bollard” at the exit of the lock. When the horse pulls you double the horsepower as the rope is turning over the pulley and this gets the boat moving. 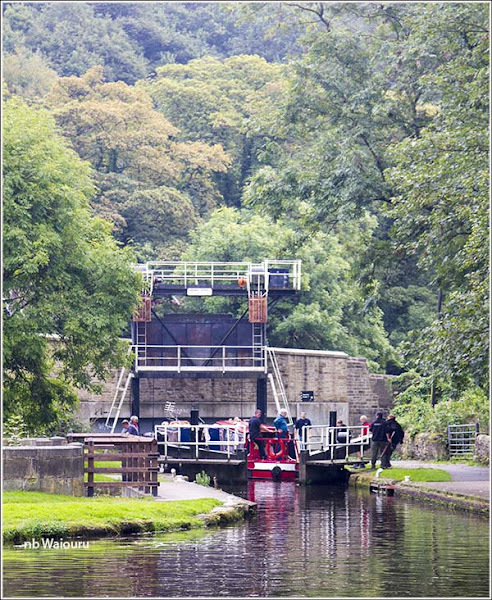 As the boat exits the lock the angle causes the rope to automatically slip off the bollard and it then pulls through the pulley until the knot and loop stops it pulling through and you are back to normal horsepower. I don't know why.... But sometimes I get a name fixed in my mind and then repeat the error. All fixed now!